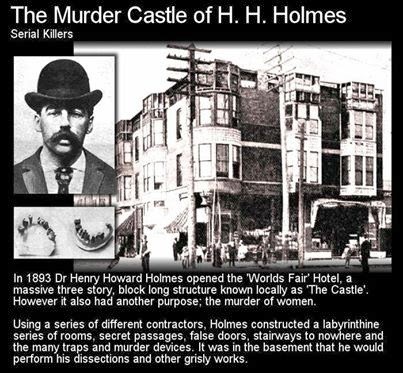 INFORMATION-EDUCATION The Murder Castle of H. H. Holmes, America's first serial killer. The Murder Castle of H. H. Holmes, America's first serial killer. How Dr H. H. Holmes Become Worst Serial Killer ? May 8, 1896 Herman Webster Mudgett was hanged at Moyamensing Prison (now the Philadelphia County Prison). It was a slow death for Mudgett, as his neck failed to snap and he slowly strangled by the noose around his neck. For fifteen minutes he twitched before he was still. A horrible way to die but many believe it was no less than he deserved. Mudgett was executed after been found guilty of 4 counts of murder in the first degree and 6 counts of attempted murder. However, his tally was higher than that.... much higher. Mudgett confessed to 27 murders, but may have killed no less than 200 people. Herman Webster Mudgett, alias Dr. Henry Howard Holmes, was one of the first documented serial killers in America, and this is his story. Herman Webster Mudgett was born in New Hampshire, May 16, 1861, to a highly religious mother, and a violently sadistic, alcoholic father. Mudgett's early school years were not easy, as he was constantly bullied. He had developed a fear of the local doctor. His fellow students discovered this and decided to make his life hell. They used to force Mudgett to spend some time in a dark room with the schools anatomical skeleton, which were real bone back in those days. Mudgett became fascinated with it and developed an obsession with death. In 1884 he developed his first scam while in medical school. He would steal the medical cadavers, and take out life insurance policies on them, before claiming they had been killed accidentally and making off with the money. Mudgett passed his exams, and started a career in the pharmaceuticals industry. It was about this time that Mudgett formed the alias Dr H. H. Holmes, which became the main name he used from thereon in. In 1886 Holmes moved to Chicago, where he took up employment in a drug store. His boss, a Dr E Holton, was suffering from cancer and when he died Holmes convinced the wife to sell him the drug store. A loan was drawn up, but soon after, Mrs Holton disappeared. Dr H. H. Holmes had had his eye on a vacant lot of land across from the drug store, which he soon purchased. For a number of years locals watched as the 'castle' took on its form, a massive three storied block long building, that housed both Holmes new drug store, several other shops and the upper floors, serving as a hotel for the 1893 Chicago Worlds Fair. Dr H. H. Holmes had used several different contractors throughout the construction, changing builders and other tradesmen, so that only one person knew the full layout; Dr H. H. Holmes himself. Dr H. H. Holmes would mainly only let out his hotel rooms to single, young, out of town women. The Hotel was located only a few miles out from the main fair grounds and with the cheap accommodation, Holmes had his pick of potential hotel guests. Dr Holmes also hired a staff of young women, but there was a strange quirk to the condition of their employment. The women had to take out life insurance, stating Holmes was the sole beneficiary and in exchange Holmes would pay the monthly premium. When a young lady Holmes liked opted to stay at his hotel (or one of his female employees chose to stay a night), he would choose whether or not they were going to leave. He had many methods with which he could murder his victims, and that was the hardest choice he had to make. When the hotel was constructed, it was built on the plans of a genius madman. The upper two floors contained a labyrinth of corridors and rooms that did not make sense. Stairways that led to nowhere, doors that opened to brick walls and hallways that took many twists and turns. There was also a series of secret rooms, passages and peep-holes. Many of the hotel rooms themselves were kitted out with a range of macabre fittings. All the 'murder rooms' were soundproofed, as Dr H. H. Holmes liked his victims to suffer long, enduring deaths. Each of these rooms he could view from an adjacent secret room, and watch his victims suffer. Some rooms were insulated with asbestos and contained gas pipes. He could flood the room with gas causing the victim a slow suffocation or he could ignite the gas and incinerate them alive. At other times, he entered the rooms through a secret passage as the women slept, and knocked them out with chloroform. These women were especially unlucky, as they would wake up on a homemade 'rack', a device which, through cranking, would stretch the victim slowly until they passed out from the pain and shock. If one of his victims managed to escape their room, they had little chance of making it out of the building. The nonsense layout of passageways was hard to navigate, plus Holmes had sliding walls installed to further confuse and trap a victim. Once his victims died, Holmes had several different methods of disposing the bodies. Several greased chutes were located throughout the building, and these all lead to a double leveled basement, which was kitted out with vats of acid, an incinerator, a torture chamber and a fully equipped surgery. Holmes enjoyed dissecting his victims (it is suggested he also performed vivisect ions; live dissections) stripping the flesh from their bones and turned into anatomical models which he sold to medical schools (as skeletons and separate organs). Other victims would be incinerated, or immersed in acid, to get rid of the remains. Once the Worlds Fair had finished, and not so many people came to stay in his hotel, Holmes began to struggle to pay his bills. He soon left Chicago for Texas, where he had inherited two large properties from women (sisters) who he had also murdered. Holmes sought to build another 'Murder Castle', but was soon moving again, attempting to better his fortunes further. Holmes was arrested in 1894 for a horse theft and spent a brief time in prison. It was here that he formed a new scam, faking his own death and collecting on the policy. However Holmes plan failed and the insurance company refused to pay. Dr H. H. Holmes needed a new victim, and he knew just the fellow: Benjamin Pitezel. Holmes had met Pitezel during the construction of his Chicago 'Murder Castle'. Pitezel was a carpenter who had a somewhat colored history. Pitezel was to fake his own death, and his wife would collect the policy, splitting it with all the parties involved. Dr H. H. Holmes was to provide an appropriate cadaver. However, Holmes took an easier route: he burned Pitezel alive and collected on the insurance policy. Holmes would later visit Pitezel's grave where he took great pleasure in cutting into the corpse for 'microscopic analysis'. Pitezel's wife was a little perturbed by all this, however she was deeply embroiled in the scam and Holmes used that as leverage to take custody of three of the five Pitezel children, Alice, Nellie and Howard. Holmes needed to get rid of Mrs Pitezel and convinced her that her husband was not dead but was rather in hiding in South America. He had taken three of the children as it would be harder to identify her as being Pitezel's wife if she did not have a full complement of her children (in case the police tailed her). Dr H. H. Holmes and Mrs Pitezel travelled along parallel routes, but the children never saw their mother again. Holmes killed Alice and Nellie in Toronto and buried them in the cellar of a house he had rented there. They were so badly decayed, that when the bodies were recovered and Nellie was being lifted, her braid came away from her scalp. Holmes also killed young Howard Pitezel through strangulation, cut up the body and burned it on a stove.